After The Dons first pre-season friendly was the cancelled up in Inverness due to injuries, followed by another fixture with Cove cut short due to a serious injury, The Dons fans would’ve been forgiven for thinking “here we go again” after kick-off was delayed by half an hour due to the visitors – West Bromwich Albion – flight being delayed. 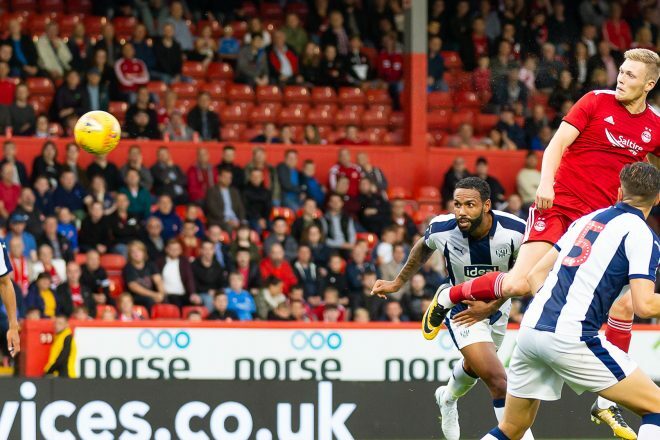 Thankfully the game got underway and Aberdeen kicked off their first ever meeting with West Brom. Chris Forrester showed a glimpse of his creativity attempting a speculative effort from inside his own half forcing Baggies keeper Jonathan Bond to scamper back and watch the ball sail just over his crossbar. Forrester and Wright both looked lively in midfield, playing positively and looking to take the game to the visitors. Ball was also solid in midfield, breaking the play up well and setting up a platform for the attack-minded players to play off. Both teams remained unchanged as they came out for the second half. Cosgrove had another half chance after some head tennis in the West Brom penalty area. The striker got on the end of Logan’s nod across but could get his head over the ball and his effort sailed comfortably over the bar. Just after the hour mark, Darren Moore rung the changes in personnel. Michael Devlin went close with a header from a set piece but he couldn’t divert his header on target. That was his last action of the tie before he was replaced by trialist Novak, and goalscorer Cosgrove was replaced by Stevie May. The Dons looked the more likely side to nick a winner as the game entered the final 10 minutes. Gleeson made an instant impact and nearly set up the winner. The number 8 whipped in a great ball in the direction of Graeme Shinnie who crept in at the back post. The Dons captain managed to get his head on the end of it but his effort was straight at substitute keeper Alex Palmer who did well to parry away and out of danger. Connor McLennan came on for a quick cameo in the last few minutes, replacing the excellent Lewis Ferguson. That was the last action of note and referee Willie Collum brought the game to a close. A draw was probably a fair result on the balance of play, with plenty of positives to take into Thursday’s Europe League qualifier with Burnley.